SINGAPORE - The haze episode in 2015 went down in history as the worst on record, surpassing even the 1997 and 2013 crises. In a bid to assess the implications for South-east Asia, a regional study on its economic, health and social impacts will be conducted. This will allow affected countries to better understand the impact of transboundary haze and supplement existing estimates on the cost of the 2015 haze. Details of the type of data that will be included in the study are still being worked out, Mr Masagos Zulkifli, Singapore's Minister for the Environment and Water Resources, told the media on Wednesday morning (May 4). This is because different countries collect different types of data depending on their economies. Singapore, for instance, collects data on affected tourism while Indonesia collects data related to agriculture. Mr Masagos noted that while there is no timeline yet for when the study will be completed, he hopes there will be some results in a year. He was speaking during the press conference for the 18th Meeting of the Sub-regional Ministerial Steering Committee (MSC) on Transboundary Haze Pollution, which was held in the Marina Mandarin Hotel in Singapore on Wednesday morning. Hosted by Singapore, the meeting was attended by environment ministry representatives from Malaysia, Thailand, Brunei Darussalam and Indonesia. Indonesia was represented by Mr Arief Yuwono, senior adviser to the Minister for Energy. 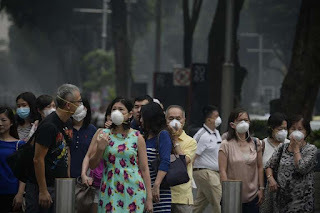 Smoke-belching forest and peatland fires that burn in Indonesia are the main cause of the haze experienced by Singapore and the region during the traditional dry season between June and October every year. In 2015, the fires burned harder and for longer due mainly to the El Niño weather phenomenon, which is linked to prolonged hot and dry weather in this region. It resulted in prolonged haze that clouded the skies of Indonesia and its neighbours - causing illness and death, grounding flights and closing schools. During Wednesday's meeting, the ministers noted that the effects of El Nino are expected to subside by the middle 2016, when the dry season typically begins. They also noted that La Nina conditions, a weather phenomenon associated with more rain this region, is expected to kick in by the third quarter of 2016. While this could bring more rain to the parched, fire-prone landscape in Indonesia amid the dry season, Mr Masagos noted there could still be periods of dry spells in between bouts of rain. But the hope is that haze of last year's scale will not affect Singapore when June comes around.